If there’s one thing you need to know about fondue, it is not a posh dish though it may look so. In fact, fondue originated from Alpine farmers. Back in the 1600s, farm labourers would cook up hardened cheese during winter as a way to use up their leftover bread. It is then mixed with garlic, wine, and herbs and is cooked on a pot called caquelon over a fire. Traditionally, families would gather around this pot and have their bits of bread dipped in the gooey, melted cheese. Until today, the same practice brings people together over good food. Seeing this as a chance to boost the cheese market, the Swiss Cheese Union made fondue Switzerland’s national dish in 1930. Hence, fondue became part of Swiss food tradition. Read our Zurich City Guide to get to know more about the Swiss way of life through their local food and drinks. A classic cheese fondue is quite simple to make. However, there are some things you need to learn to ensure you won’t have to deal with a lumpy and bumpy cheese—not to mention, losing your bread in it. Otherwise, you’d be punished. There are a wide array of cheeses to choose from. But in making fondue, you would only want to pick well-ripened and well-aged cheeses as they are good for melting compared to standard commercial cheeses. and emmental cheeses. These cheeses are mostly produced in Switzerland and France but if you’re lucky, you may find some in continental specialty stores. The standard Swiss recipe usually yields a gooey cheese pot with a nutty flavour. If you feel experimental though, you can combine two other cheeses that would work well for fondue. 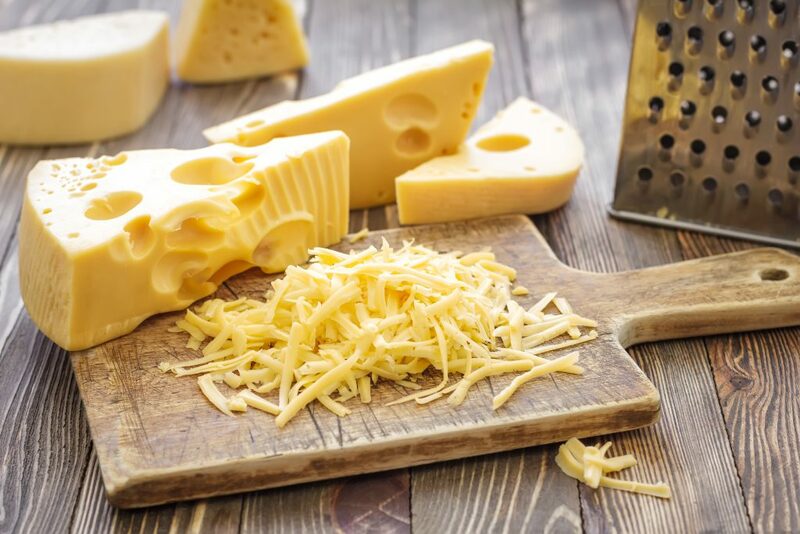 These include Swiss, fontina, cheddar, monterey jack, goat’s cheese, gouda, mozzarella, provolone, parmesan, and parmigiano-romano to name a few. Be mindful though, flavours would vary depending on your choice of cheese. The key to achieving a smooth fondue is to coarsely grate—not chop—your cheese before melting. It makes everything smooth, fast, and easy while assuring you good results. If you’re grating a great amount of cheese, you may want to use a food processor to save time. Otherwise, a coarse grater or box grater would do. 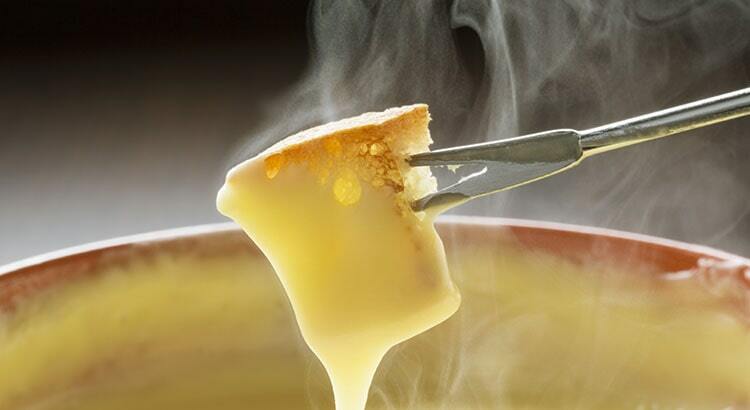 When melting, gradually add cheese to your saucepan and melt on a low, even heat. It will take a few minutes but be patient and monitor your cooking. Stir continuously as you wouldn’t want to let the cheese boil and burn. Adding dry white wine and kirsch (cherry liqueur) to fondue is standard practice for the Swiss. Though making a paste with cornflour is frowned upon by purists, it helps you achieve a smoother fondue. In our cheese fondue recipe, we dissolved cornflour into the kirsch and added it later to the cheese and white wine mixture after a few minutes on the stove. The acid in kirsch and white wine helps to break up the stringines of cheese while the cornflour prevents it from clumping. The result is lump-free fondue. Wine would make a great impact on the taste of your fondue. You can use any of these: chenin blanc, dry vermouth, muscadet, pinot blanc, pinot grigio, sauvignon blanc, and viognier. Just make sure to pick something you would love to drink with your fondue. Tip: If you prefer to use non-alcoholic acid, you can substitute wine with lemon juice or unsalted chicken or vegetable stock. Simply adjust the proportion based on the recipe you’re following. Believe it or not, there’s also the art of picking a good fondue pot for your needs. Fondue pots may be made from stoneware, ceramic, cast iron, or stainless steel. And they come with a set of burner and forks. While it’s not necessary to own one, it makes the experience extra special. It also helps keep the cheese warm and gooey. Otherwise, you would have to keep warming it up on the stove. 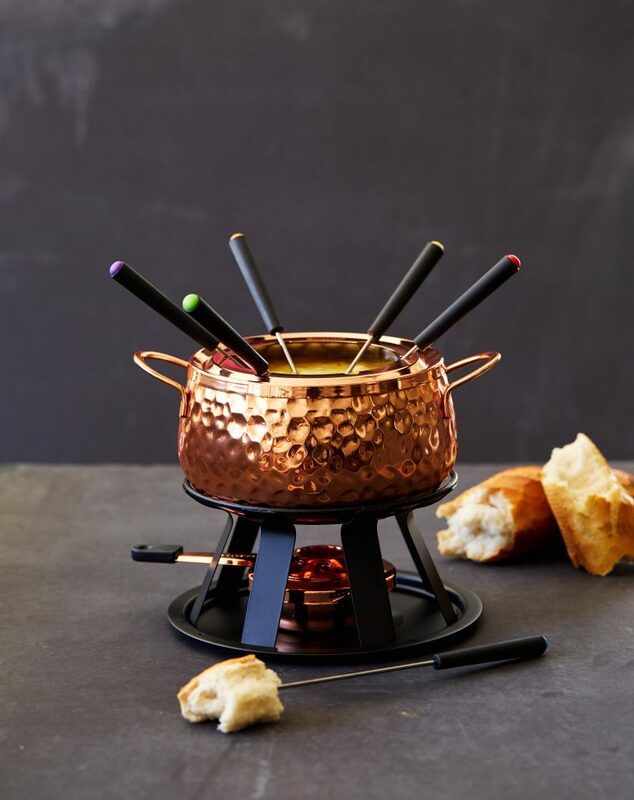 Turn a simple fondue party into an elegant affair with this gorgeous copper-plated Swissmar Biel Fondue Set. Electric fondue set is a versatile equipment. Aside from keeping your cheese warm, it can also serve broth and chocolate. It helps you control the temperature easily and is perfect for serving fondue to big crowds. However, because it needs a power socket, it can be tricky to set up and clean up after. Ceramic or cast iron fondue sets, on the other hand, are more ideal for household use. It brings a more traditional vibe and is easy to place anywhere. You may have to buy tealight candles or special fire gels to keep the pot warm for at least two hours. Before transferring the cheese, rub a fresh garlic clove on the inside of the serving pot to give a garlicky essence to your fondue. If you want, you could also mince a clove or two and add it directly to the cheese. It is universally acknowledged that cubed bread is the simplest and greatest pair to cheese fondue. But to make it more interesting, you could also serve cubed apples, cherry tomatoes, bacon, roasted baby potatoes, steamed broccoli, or pickles. For the wine pairing, you can simply serve the leftover white wine, kirsch, or a cup of herbal tea. According to Swiss lore, any other drink—water, juice, beer, or soda—will cause the cheese to form a giant ball in your stomach and leave you with indigestion. It is a myth, of course, so you can actually drink whatever you think goes well with cheese. After all, fondue is supposed to be a comforting dish that makes you happy. Get our favourite cheese fondue recipe. We all love cheese but with melted cheese, what could go wrong? Let this ultimate guide help you make the perfect Swiss cheese fondue at home.